Iron Tail (Oglala Lakota: Siŋté Máza in Standard Lakota Orthography) (1842 – May 29, 1916) was an Oglala Lakota Chief and a star performer with Buffalo Bill's Wild West. Iron Tail was one of the most famous Native American celebrities of the late 19th and early 20th centuries and a popular subject for professional photographers who circulated his image across the continents. Iron Tail is notable in American history for his distinctive profile on the Buffalo nickel or Indian Head nickel of 1913 to 1938. Siŋté Máza was the chief's tribal name. Asked why the white people call him Iron Tail, he said that when he was a baby his mother saw a band of warriors chasing a herd of buffalo, in one of their periodic grand hunts, their tails standing upright as if shafts of steel, and she thereafter called his name Siŋté Máza as something new and novel. Chief Iron Tail was one of the most famous Native American celebrities of the late 19th and early 20th centuries. Professional photographers circulated his image across the continents. Chief Iron Tail is often mistaken by historians for Chief Iron Hail ("Dewey Beard"), being Lakota contemporaries with similar sounding names. Most biographies incorrectly report that Chief Iron Tail fought in the Battle of the Little Bighorn and that his family was killed in 1890 at Wounded Knee, when in truth it was Chief Iron Hail who suffered the loss. Major Israel McCreight reported: "Iron Tail was not a war chief and no remarkable record as a fighter. He was not a medicine man or conjuror, but a wise counselor and diplomat, always dignified, quiet and never given to boasting. He seldom made a speech and cared nothing for gaudy regalia, very much like the famed War Chief Crazy Horse. In this respect he always had a smile and was fond of children, horses and friends." Chief Iron Tail was an international personality and appeared as the lead with Buffalo Bill at the Champs-Élysées in Paris, France and the Colosseum in Rome, Italy. In France, as in England, Buffalo Bill and Iron Tail were feted by the aristocracy. Iron Tail was one of Buffalo Bill's best friends and they hunted elk and bighorn together on annual trips. On one of his visits to The Wigwam of Major Israel McCreight, Buffalo Bill asked Iron Tail to illustrate in pantomime how he played and won a game of poker with U S. army officials during a Treaty Council in the old days. "Going through all the forms of the game from dealing to antes and betting and drawing a last card during which no word was uttered and his countenance like a statue, he suddenly swept the table clean into his blanket and rose from the table and strutted away. It was a piece of superb acting, and exceedingly funny." Iron Tail continued to travel with Buffalo Bill until 1913, and then the Miller Brothers 101 Ranch Wild West until his death in 1916. Gertrude Käsebier was one of the most influential American photographers of the early 20th century and best known for her evocative images of Native Americans. Käsebier spent her childhood on the Great Plains living near and playing with Sioux children. In 1898, Käsebier watched Buffalo Bill's Wild West troupe parade past her Fifth Avenue studio in New York City, toward Madison Square Garden. Her memories of affection and respect for the Lakota people inspired her to send a letter to Buffalo Bill requesting permission to photograph Sioux traveling with the show in her studio. Buffalo Bill and Käsebier were similar in their abiding Native American culture and maintained friendships with the Sioux. Buffalo Bill quickly approved Käsebier's request and she began her project on Sunday morning, April 14, 1898. Käsebier's project was purely artistic and her images were not made for commercial purposes and never used in Buffalo Bill's Wild West program booklets or promotional posters. Buffalo Bill Cody told Major Israel McCreight that "Chief Iron Tail is the finest man I know, bar none." Käsebier took classic photographs of the Sioux while they were relaxed. Chief Iron Tail was one of Käsebier's most challenging portrait subjects. Käsebier's session with Chief Iron Tail was her only recorded story: "Preparing for their visit to Käsebier's photography studio, the Sioux at Buffalo Bill's Wild West Camp met to distribute their finest clothing and accessories to those chosen to be photographed." Käsebier admired their efforts, but desired to, in her own words, photograph a "real raw Indian, the kind I used to see when I was a child', referring to her early years in Colorado and on the Great Plains. Käsebier selected one Indian, Chief Iron Tail, to approach for a photograph without regalia. He did not object. The resulting photograph was exactly what Käsebier had envisioned: a relaxed, intimate, quiet, and beautiful portrait of the man, devoid of decoration and finery, presenting himself to her and the camera without barriers. Several days later, Chief Iron Tail was given the photograph and he immediately tore it up, stating that it was too dark. Käsebier re-photographed him, this time in his full feather headdress, much to his satisfaction. Chief Iron Tail was an international celebrity. He appeared with his fine regalia as the lead with Buffalo Bill at the Avenue des Champs-Élysées in Paris, France, and the Colosseum of Rome. Chief Iron Tail was a superb showman and chaffed at the photo of him relaxed. but Käsebier chose it as the frontispiece for a 1901 Everybody's Magazine article. Käsebier believed all the portraits were a "revelation of Indian character," showing the strength and individual character of the Native Americans in "new phases for the Sioux." Early in the twentieth century, Iron Tail's distinctive profile became well known across the United States as one of three models for the five-cent coin Buffalo nickel or Indian Head nickel. The popular coin was introduced in 1913 and showcases the native beauty of the American West. Bee Ho Gray, the famous Wild West performer, accompanied Chief Iron Tail to act as an interpreter and guide to Washington D.C. and New York where Iron Tail modeled for sculptor James Earle Fraser as he worked on designs for the new Buffalo nickel. Iron Tail was the most famous Native American of his day and a popular subject for professional photographers who circulated his image across the continents. Chief Iron Tail was a friend of Major Israel McCreight and a frequent visitor to The Wigwam in DuBois, Pennsylvania. Chief Iron Tail and Chief Flying Hawk considered The Wigwam their home in the East. On June 22, 1908, Chief Iron Tail presided over a ceremony at the tent of Buffalo Bill adopting McCreight as an honorary Chief of the Oglala Lakota. In 1915, McCreight hosted a grand reception for Iron Tail and Flying Hawk at The Wigwam. On June 22, 1908, Chief Iron Tail and "Buffalo Bill" Cody visited Du Bois, Pennsylvania with the Wild West Congress of Rough Riders. Twelve thousand people a day attended Cody's Wild West performances and 150 Oglalas were in town with 150 ponies. On this occasion, Chief Iron Tail presided over the adoption of Major Israel McCreight as an honorary Chief of the Oglala Lakota and named McCreight "Čhaŋté Tȟáŋka ("Great Heart"). Chief Iron Tail performed the ceremony assembled at Buffalo Bill's tent and attended by Chief American Horse, Chief Whirlwind Horse, Chief Lone Bear and 100 Oglala Lakota members of the Wild West Congress of Rough Riders. The Oglala Lakota chiefs formed a small circle around McCreight and his wife Alice, and Chief Iron Tail began the ceremony with a speech in Lakota, a hearty handshake all around, and then placed a war bonnet McCreight's head and moccasins upon his feet. Chief Iron Tail then presented McCreight with a tepee on which an owl had been traced with yellow chalk and told this was for him and Alice to live in. Tom-tom drums were then beaten and tribal songs put up vigorously. Concluding remarks were made by Chief Iron Tail ending with hearty handshakes. Chief Iron Tail and Buffalo Bill were loaded into a new 1908 Rambler touring car and driven to McCreight's town house for the banquet which followed. There, Chief Iron Tail was presented with a new Winchester rifle as a souvenir of the event. McCreight was forever moved by the solemnity of the occasion, and carried the honor proudly and with distinction the rest of his life. McCreight later remarked that the title, honorary Chief of the Oglala Lakota, was a far greater tribute than could have been conferred by any president or military organization. Grand Reception for Chief Iron Tail and Chief Flying Hawk, The Wigwam, DuBois, Pennsylvania, 1915. In 1915, McCreight hosted a grand reception for Chief Iron Tail and Chief Flying Hawk at The Wigwam in Du Bois, Pennsylvania. "When Chief Iron Tail was finished with greeting the long line of judges, bankers, lawyers, business men and neighbors who filed past in a receiving line just as the President is obliged to receive and shake the hands of multitude of strangers who call on New Years, the chief grasped hold of the fine buffalo robe which had been thrown over a porch bench for him to rest on drawing it around his shoulders, walked out on the lawn and lay down to gaze into the clouds and over the hundred mile sweep of the hills and valleys forming the Eastern Continental Divide. He had fulfilled his social obligations when he had submitted to an hour of incessant hand-shaking, as he could talk in English, further crowd mixing did not appeal to him. He preferred to relax and smoke his redstone pipe and wait his call to the big dining room. There he re-appeared in the place of honor and partook of the good things in the best of grace and gentlemanly deportment. His courteous behavior, here and at all places and occasions when in company of the writer, was worthy of emulation by the most exalted white man or woman!" After Chief Iron Tail had shaken hands with the assembled guests he gathered the big buffalo hide about his shoulders, waived aside the crowd and walked away. He spread the woolly robe on the grass, sat down upon it and lit his pipe, as if to say, "I've done my social duty, now I wish to enjoy myself." Chief Flying Hawk long remembered the gala festivities. "Here he himself and his close friend Iron Tail had held a reception once long ago, for hundreds of their friends, when bankers, preachers, teachers, businessmen, farmers, came from near and far along with their ladies, to pay their respects and say, How Cola!" "The historian Chief Flying Hawk reminded that when dinner was served, Iron Tail asked to have his own and Flying Hawk's meals brought to them on the open porch where they ate from a table he now sat beside, while the many white folks occupied the dining-room, where they could discuss Indians without embarrassment. This, he remembered, was a good time, and they talked about it for a long time together, but now, his good friend had left him and was in the Sand Hills." In May 1916, Chief Iron Tail, at the age of 74, became ill with pneumonia while performing with the Miller Brothers 101 Ranch Wild West in Philadelphia, Pennsylvania, and was placed in St. Luke's Hospital. Buffalo Bill was obliged to go on with his show next day to Baltimore, Maryland, and Iron Tail was left alone in a strange city with doctors and nurses who could not communicate with him. McCreight learned about the Chief's admission to the hospital in the morning Philadelphia paper, and immediately sent a telegram to Buffalo Bill to send Iron Tail by next train to Du Bois, Pennsylvania, for care at The Wigwam. No reply was had and the wire was not delivered or forwarded to Baltimore. Instead the hospital authorities put Chief Iron Tail on a Pullman, ticketed for home to the Black Hills. On May 28, 1916, when the porter of his car went to wake him at South Bend, Indiana, Iron Tail was dead, his body continuing on to its destination. Buffalo Bill expressed regret that the Chief was sent to the hospital and that he had not received the telegram. Iron Tail's body was transferred to a hospital in Rushville, Nebraska, then to Pine Ridge Indian Reservation, where he was buried at Holy Rosary Mission Cemetery[permanent dead link] on June 3, 1916. With deep emotion, Buffalo Bill said he was going to put a granite stone on Chief Iron Tail's grave with a replica of the Buffalo nickel (for which Chief Iron Tail had posed) carved on it as a memento. 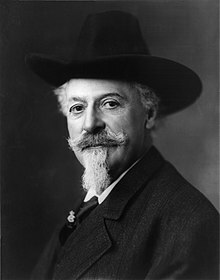 However, Buffalo Bill died on January 10, 1917, just six months after Chief Iron Tail's death. In a ceremony at Buffalo Bill's grave on Lookout Mountain, west of Denver, Colorado, Chief Flying Hawk laid his war staff of eagle feathers on the grave. Each of the veteran Wild Westers placed a Buffalo nickel on the imposing stone as a symbol of the Indian, the buffalo, and the scout, figures since the 1880s that were symbolic of the early history of the American West. Wikimedia Commons has media related to Iron Tail. ^ McCreight, Major (1943). The Wigwam : Puffs from the Peace Pipe. Sykesville, Pa: Nupp Printing Co. p. 11. OCLC 756194877. Retrieved August 15, 2012. ^ It is unknown exactly when Iron Tail joined Colonel Cody. In 1910, the New York Times reported that "Iron Tail has been associated with Buffalo Bill for some eighteen years. See "Ogallallas Make A Little Boy Chief", New York Times, May 9, 1910. ^ Puffs From the Peace Pipe", p. 10. ^ "Chief Iron Tail and his Sioux braves, squaws, and papooses, will sail on the French liner La Gascogne this morning for Havre, and will be met at Versailles by Jacob White Eyes, Buffalo Bill's chief interpreter, who married a French girl and is able to scramble on all fours through the French language. Col. Cody himself accompanied the party from the town of his name to Chicago. He will arrive here this morning and see that Iron Tail and his party sail." New York Times, February 8, 1906. ^ "He is the finest man I know, bar none." Puffs from the Peace Pipe, p.10. ^ Delaney, "Buffalo Bill's Wild West Warriors: A Photographic History by Gertrude Käsebier", Smithsonian National Museum of American History (2007). ^ Delaney, "Buffalo Bill's Wild West Warriors: A Photographic History by Gertrude Käsebier", Smithsonian National Museum of American History (2007), at p.16. ^ Delaney, "Buffalo Bill's Wild West Warriors: A Photographic History by Gertrude Käsebier", Smithsonian National Museum of American History (2007), p.16-17. ^ The Native American depiction on the coins obverse is believed to be based on three different American Indians. Two of the American Indians who modeled for Fraser as he sculpted the coin were named by the designer before his death. They were Chief Iron Tail of the Lakota Sioux and Chief Two Moons of the Cheyenne. Although many have claimed to have had a sitting with Fraser for this design, he could not recall the name of the third person, and satisfactory documentation has not yet been found to identify that individual. It is widely believed that the bison on the coin's reverse was modeled after Black Diamond, a popular attraction at the New York Zoological Gardens. http://www.usmint.gov/mint_programs/nickel/?action=fraser In 1931, Fraser wrote that he had used three Indians for the piece, including "Irontail, the best Indian head I can remember. The other one was Two Moons, the other I cannot recall." David Q. Bowers, "A Guide Book of Buffalo and Jefferson Nickels (2007). ^ In later years, McCreight used the name "Tchanta Tanka" because it was spelled as Cante Tanka was pronounced in Lakota. Since most of the Native members did not know phonetics and spelling, they did not write out the name for McCreight, and since their language was not written, people would come close to approximating the sound and put together a spelled version. Chet Baranowski, Senior Advisor of Native American Studies at the Niagara Falls Museum, Niagara Falls, Canada. ^ Puffs From the Peace Pipe, p.10., Firewater and Forked Tongues, p.xxiii-xxiv. ^ Chief Iron Tail was reported in the Cook County, Illinois, Deaths Index, 1872-1922, as born abt 1842, and place of death, Chicago, Cook, Illinois, on May 29, 1916. Iron Tail's occupation is listed as Showman, with his residence and place of burial as Rushville, Nebraska. His age is reported as 74. This page was last edited on 22 November 2018, at 03:40 (UTC).